Residual Styling occurs when the theme adds styles that apply to UberMenu with high specificities that override UberMenu’s styles. Generally, you’d set this value to the ID of the theme container. In this example, UberMenu’s link text is set to red, but the text appears blue due to residual styling from the theme. This can be overcome with the Custom Style Prefix setting. This selector has a specificity of 20 (2 classes). This selector has a specificity of 102 (1 ID, 2 elements). Since the theme is using element selectors rather than classes as it should be in a modular system such as WordPress, this style still applies to UberMenu when it should not be. Since the specificity of the theme’s selector is higher (102 > 20), the theme’s styles override UberMenu’s styles, and the link text appears blue. This is “residual styling” from the theme. The specificity of this style is 120 (1 ID, 2 classes). Since 120 > 102, now UberMenu’s styles override the theme styles, and the link text is red. Remember, the prefix gets appended to all styles. You can’t use the ID on UberMenu itself, it must be an element that contains UberMenu. This has to be taken on a case by case basis. Most of the time a single ID is the way to go. But say the theme is doing something strange like using #header #nav as its selector, you’ll need to make your prefix high enough specificity to override this. Remember that this prefix will apply to and replace ALL UberMenu styles. 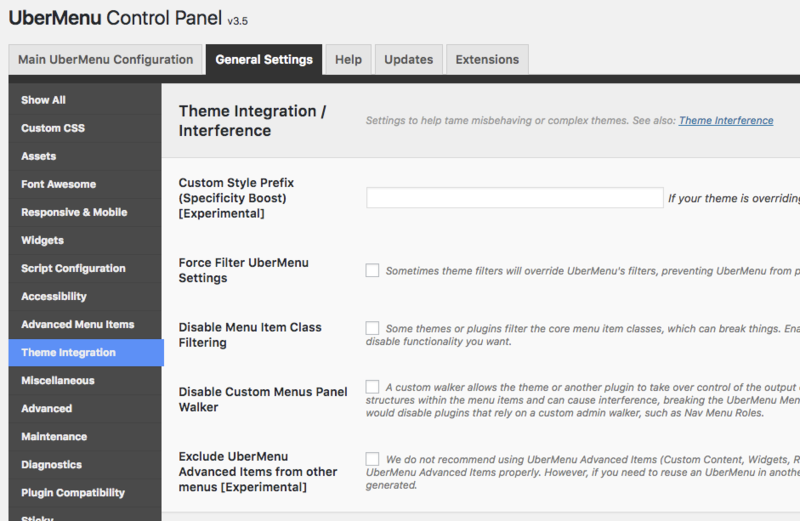 So if you’re using multiple UberMenus, make sure your prefix still selects all UberMenus on the page. If your prefix limits the styles to apply to a single UberMenu, then UberMenus outside of that container will be entirely unstyled. Therefore, use the outermost selector that will give you the specificity you need. Likewise, make sure the ID you use is present globally – not just on the page you’re currently inspecting. For all of this, using the Chrome Developer Tools (or equivalent inspector in your browser) is critical and makes the job easy. Both the Custom Style Prefix and Manual Integration are potential solutions to the same problem: interfering styles from the theme that override UberMenu styles. The Custom Style Prefix works by generating styles that override the theme’s styles, by using higher specificity CSS selectors. Manual Integration works by eliminating the interfering styles from applying in the first place, by changing the site markup such that the theme’s CSS selectors no longer apply to UberMenu. Which is better? In general, I think that manual integration is cleaner. I think it’s better to not apply unnecessary styles in the first place, than to apply them and then override them. But in practice, it’s likely not a big issue. In the end, the best choice will depend on the specifics of your theme and your own capabilities. For *most* themes that cause residual styling, either option can work. While I would generally lean toward manual integration when possible, if you’re not sure how to approach that, the Specificity Boost is definitely a viable option. Side note: This can all be avoided if the theme simply codes its menu modularly, either by using classes (.menu-item) rather than elements (li) in its selectors, or prefixing all of its selectors with an ID or class added via wp_nav_menu(), which UberMenu can then override. In other words, if coded properly, there’s no reason the theme’s styles should be applying to any menu other than its own in the first place.